In the initial stage we’ll define the scope of the project, your vision for the future garden, and a general budget to work toward. Lots of time will be spent on site, getting to know your property. Spending this time in the early stages getting to know a place intimately ensures that the resulting garden feels settled in the landscape, rather than imposed upon it. Practically speaking, documenting the existing conditions of a site also allows for a design that creates the least amount of disturbance. A commitment to working lightly on the land means working with the existing topography, soils, vegetation, and microclimates as much as possible. The design process that follows develops the garden design plan in a way that fits harmoniously and gently with the existing landscape. Working from the information gathered in Phase 1, the conceptual design stage focuses on putting ideas on paper. 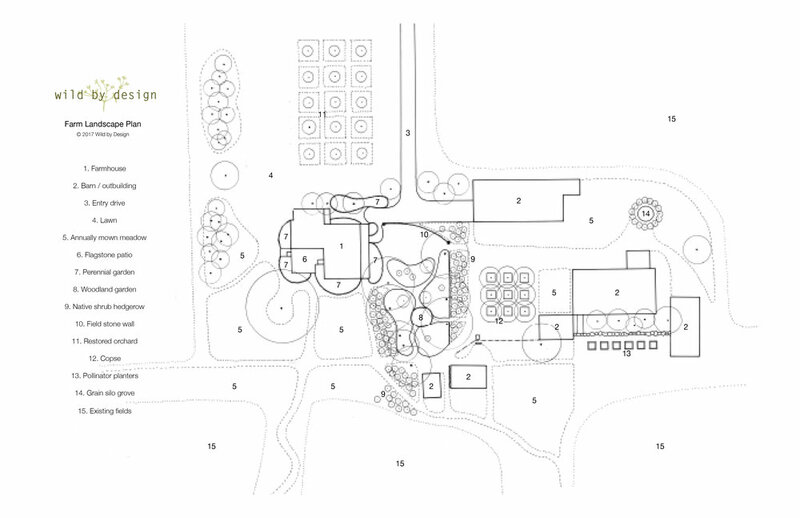 The conceptual plan will develop the garden’s general layout - where paths will move, where key planting areas will be located, and how spaces will be arranged. Preliminary palette documents will illustrate the planting aesthetic, seasonal dynamics, and colour schemes of the garden, while other documents will outline the other components including built features, site furniture, sculpture, lighting etc. Conceptual design is the most iterative phase of the design process as ongoing conversations and site visits bring new ideas to the table. Only when a conceptual plan is finally settled on does the process move to Phase 3. After a preferred conceptual plan is chosen, the focus shifts to creating a polished final landscape plan and a cost estimate for its implementation. At this stage final decisions are made concerning the built features of the garden and most importantly, its planting. Planting design documents are prepared, outlining the palette of plants that will feature in the garden. On some small projects or town gardens the plan can often be implemented within a year of the design being complete, but with other projects and most large country gardens the plan is broken down into smaller pieces which can be completed in phases over a period of years. By focusing on incrementally completing the individual pieces of a plan, gardens can take shape more organically and economically. This approach allows for close attention to be given to each component as its implemented, ensuring a high quality of craftsmanship. The first stage of a garden’s implementation is the ground work. Site preparation creates the foundation for the garden. This might conjure images of big machinery and equipment tearing a landscape apart but given the preference to work lightly on the land big interventions like grading, excavating or tree clearing only take place where absolutely necessary and only where the landscape would suffer without such treatments. Local contractors, hired by the client, will undertake the more involved site preparation tasks as well as the construction of the garden's built features (patios, walkways, decks, walls, fences etc.). At this stage the planting areas are meticulously prepared to ensure that any invasive or aggressive existing plants are eliminated. Spending time preparing a planting site properly sets it up for long term success and less intensive future maintenance. Once the site is prepared, planting can begin. Plants are sourced from only the most reputable nurseries, including a network of specialty growers throughout Ontario, personally selected, and carefully delivered. Key structural plants like specimen trees and shrubs are planted first, with large specimens installed by reputable local contractors. When it comes time for the perennial planting, after developing a detailed plant palette and determining the quantities of each species, the perennials and grasses are planted more or less at random. This approach, where the planting is laid out intuitively and spontaneously on the ground by the designer, creates a garden that feels authentically natural, without the rigidity or formality of plantings laid out exactly from a plan. A garden is only ever as good as the maintenance it receives. Even for naturalistic gardens that are planted with durable, long-lived, resilient plants this saying holds true. Growing a garden is like raising a child. Overindulgence and indifference both lead to failure. Intelligent care is the key. Ben personally manages each newly planted garden through its first growing season, guiding the planting through the critical establishment phase. After this first season, there are two options for the ongoing care of the garden. The planting can be managed by either a keen and green-thumbed client, or by a professional landscape company, with periodic checkup visits with Ben to monitor its evolution. Alternatively, for gardens within Prince Edward County and especially those where clients are part-time or seasonal residents, Ben can continue to provide ongoing maintenance services, with monthly visits from April through October to keep the planting looking its best. Once established, the garden is designed to persist on average rainfall, only requiring supplemental water in periods of drought. By planting densely weeds have little space to grow and only in the early parts of the year, before the plant growth has knit together, does careful attention need to be paid to keeping the garden weed-free. Plants are living things and even the best laid planting designs can contain weak links that, for one reason or another, fail in a garden. Follow up visits to check on the garden’s progress allow for quick responses if changes need to be made. Rather than completing a static design that never deviates from the original plan, this ongoing relationship between designer and client makes for a garden that will subtly evolve as it ages, as every good garden should.